"Built in 1858 by John Wornall on his 640 acre farm, this house was in the center of heavy fighting on October 23, 1864. After the last Confederate charge to the north toward Westport was repulsed, this house was used as a field hospital for both the Union and Confederate wounded." 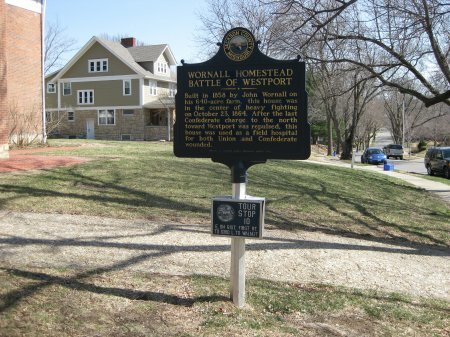 Directions to Stop #10: The Wornall Homestead is located at the intersection of Wornall Road and 61st Terrace. Leaving Tour Stop 9, drive south on Pennsylvania Avenue for about 0.7 miles until you reach 61st Terrace. Turn left (east) and continue on 61st Terrace for about 0.15 miles and cross over Wornall Road. Tour Stop 10 is on the northwest corner of the intersection. This tour stop is located in Kansas City, Missouri 64113. Description: Built in 1858, the John Wornall House originally sat on the Missouri frontier, the center of a 500-acre farm. During the 1864 Battle of Westport, both Confederate and Union armies occupied the sturdy brick farmhouse and used it as an emergency field hospital. 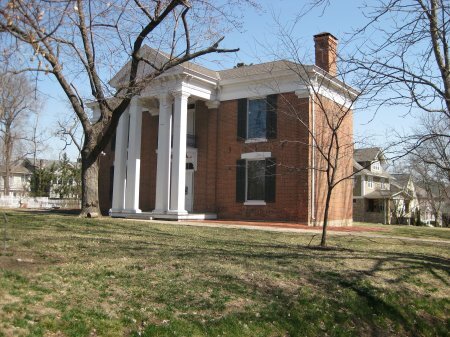 The John Wornall House Museum had been restored by the Jackson County Historical Society and is open to the public for tours. You are now standing where heavy fighting was occurring early in the afternoon on October 23, 1864. After outflanking and pushing the Confederates back from their early morning position (Tour Stop 5), the Federals had succeeded in moving their line forward to a position occupying the lane (now 55th Street) just south of the Bent House. Shelby's two brigades and Dobbins' Brigade from Fagan's Division had to fall back to a row of stone walls just north of the Wornall House. About this time, Shelby learned that Marmaduke had been unable to hold Pleasonton at Byram's Ford. The entire right flank of the Confederate army was now exposed. Fagan with Slemons' and McCray's Brigades had to move east towards the Harrisonville Road to meet a potential threat from Pleasonton's Division crossing at Byram's Ford (Tour Stop 17). Meanwhile, Curtis heard the sounds of battle to the Confederate rear and ordered the Army of the Border to charge forward. Jennison formed his First Brigade across Wornall's Lane and charged forward only to by met by Thompson's Iron Brigade. The fighting was fierce, but the Iron Brigade broke. The Federals were attacking from the north and the east. One of Pleasonton's batteries was now firing into the rebel flank from Hinkle's Grove. Now the Iron Brigade fled to the rear. They came to a long line of east-west stone fences where they turned to face the Federal attackers.